Rub the ptarmigans inside and out with salt and freshly ground black pepper. If using pheasants, cut in half and season both sides. Melt 60g of the butter in a casserole and, in batches, brown the ptarmigans or the pheasants all over. Adding the innards will give the cooking juices flavour. Pour over enough lukewarm water to half-cover the birds. Add the juniper berries, cover and simmer for 20 minutes. Add the cream, cover and simmer for a further hour, or until the birds are tender. Take the birds out of the broth and keep warm. Strain the juices through a sieve and return to a clean pan. Whisk the redcurrant jelly and flour into the sauce until slightly thickened. Whisk in the remaining butter. Adjust the seasoning if necessary. Remove the breast meat and legs from the ptarmigan carcasses (leave the pheasants as they are). 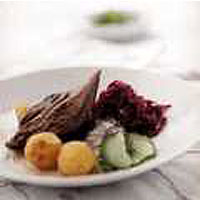 Serve with the sauce spooned over the top and the red cabbage and caramelised potatoes.